In Florida, most companies and businesses must provide workers' compensation insurance coverage to protect their employees from lost wages, medical bills, and other unexpected expenses that result from an on the job injury. If your employer is not required to provide workers' compensation coverage, then they will have to file for an exemption with the state. This page discusses workers' compensation exemption and what it means for your at work accident and injury. The Coye Law Firm is a workers' comp law firm dedicated to getting maximum benefits for injured workers. If you're injured on the job and have questions about what to do next, contact our workers compensation lawyers immediately. Your claim depends on swift action and aggressive representation for your interests. Coverage requirements vary among businesses. Employees in the construction industry, for example, are much more at risk of an on the job injury. Therefore, Florida requires construction companies to provide coverage even if they have one employee. A farmer that has five regular employees and/or 12 or more other seasonal workers that work for 30 days or more per year. The process of electing to be exempt from workers' compensation coverage is detailed in Florida statute 440.05. If your employer's business or company is small enough to be within the limits for not providing workers' compensation coverage, they have to notify the state. To register as a workers' compensation exemption, an officer of the corporation must register the business in writing with the Florida Department of State, Division of Corporations. If the company is in the construction injury, they must also pay a $50 fee, which is used for conducting audits. The Florida Division of Workers' Compensation routinely does field inspections to ensure that employers are providing workers' compensation insurance coverage for employees that are qualified to receive it. Even if the company isn't required to have workers' compensation coverage, they can be fined if they don't follow the appropriate workers' compensation exemption protocol. Workers' compensation law is complicated and unclear at times. A work comp lawyer can explain the system to you in clear terms and let you know if your employer is required to protect you with a workers' compensation insurance policy. 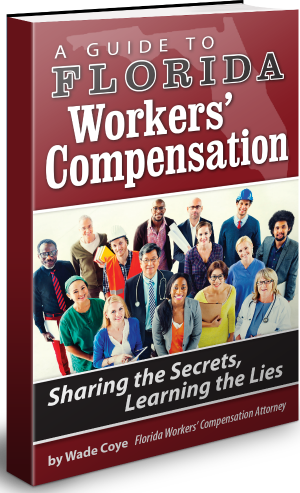 Workers' compensation exemption is important for employers and employees to understand. To discuss your on the job injury during a free consultation with an experienced attorney, call the Coye Law Firm immediately. Our staff wants to help you recover the most benefits you can under Florida's workers' compensation system. Contact us today.